THE SACRED LOTUS.–The Lotus has always been looked upon as the most sacred of all sacred flowers–why? Because it was selected as Mu’s floral symbol. Why was it so selected? The Lotus was the first flower to beautify the earth. Being the first flower and Mu the land where man first appeared on earth, Mu and the Lotus were naturally symbolic synonyms. As a mark of love and mourning, the Egyptians, after the destruction of Mu, never depicted the lotus as an open, living flower but always as closed and dead. The lotus is a prominent figure in the carvings and adornments of all ancient temples, and, except in Egypt, was continued down as open and conventional until King Solomon’s Temple. In this form, the tips of the petals are turned in. The lotus was indigenous to Mu. The plant was carried to all parts of the world by the colonists, so that wherever we find the lotus today, we know that the parent stock, like the parent stock of man, came originally from Mu. 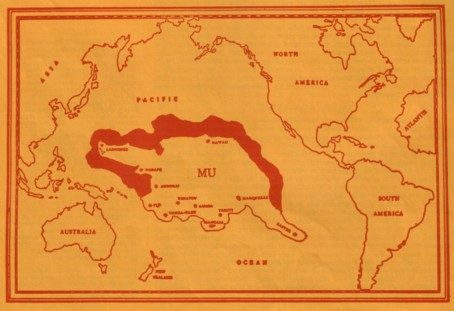 which was the alphabetical symbol for Mu as the Motherland of man. Fig. 3. The second of the four glyphs for M in Mu’s alphabet. 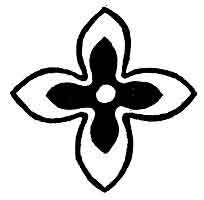 This was the symbol for Mu as the Mother of man. Fig. 4. This is the numeral 3. Three was the numeral symbol for Mu and very much used. Fig. 5. The two lotus buds are the symbols for the two islands adjacent to Mu. Mu and these two islands were geologically known as the Lands of the West. Fig. 6. An open lotus very much used in decorations and in traceries on temple walls, when it was desired to refer to Mu. The ends of the petals are turned in to denote Death. Fig. 7. 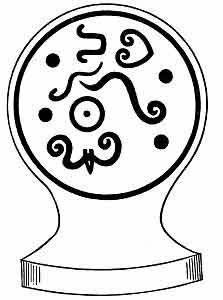 This is a symbol constantly appearing in the Maya writings and has been translated in every conceivable way except the correct one. Some of these decipherings are absolutely ludicrous, Le Plongeon’s as an example. This glyph is a compound symbol being composed of the second M in Mu’s alphabet and having at the end of each arm an imix the symbol f or breast. These breasts are shown distant from the mother; therefore physically not actually attached to it. Front view of the breast. Representing side view of the breast. Fig. 8. The withered and dying lotus: Mu’s floral symbol after she was dead. Fig. 9. The Lands of the West, at the time she was above water. Fig. 10. Mu is submerged. No light shines upon her. She is in the region of darkness. Fig. 11. The Lands of the West are in darkness. No light shines upon her. Fig. 12. Mu, the Lands of the West. Maya. Fig. 13. That Land of Kui–Maya writing. Fig. 14. Peaks only remain above the watery abyss. Codex Cortesianus. Fig. 15. 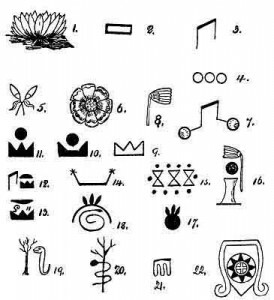 The ten tribes which were submerged with Mu. Troano MS. Fig. 16. Mu is sacrificed. She lies in the region of darkness. Book of the Dead. Fig. 17. The light of day has gone from Mu. Cliff writing, Nevada. Fig. 18. Mu lies beyond the horizon over the great waters. Cliff writing, Nevada. Fig. 19. The Tree and Serpent. Cliff writing, Nevada. Fig. 20. 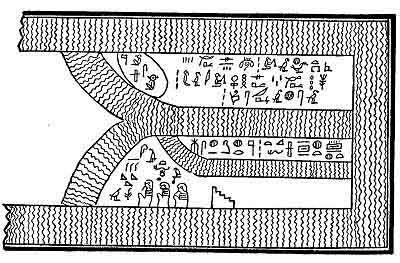 The Tree and the Serpent, as it appears in the Sacred Writings. Fig. 21. One of the forms of the letter M found in various ancient writings. Fig. 22. The royal escutcheon of Mu. Altar Painting–The Legend, Deciphering and Translation: This temple is dedicated to the Sacred Four–the Four Great Forces which issue from the mouth of The Almighty and are His commands. They first of all evolved law and order out of chaos throughout the Universe, and then created all things. They have now the charge of the physical welfare of all creations. They order and control the movements of the Universe today. This temple is under the jurisdiction of the mother church of Mu, whose High Priest is Ra Mu, who is the mouthpiece of the Almighty One. This legend is a key to the extreme age of the Mexican tablets. The legend shows that at the time the temple was built Mu was above water, because the temple is under the jurisdiction of Mu. Mu was submerged about 10,000 B. C., thus showing that this temple was built more than 12,000 years ago, but how much longer I have found nothing to indicate. While there are scores) hundreds even, of writings that tell of the destruction of Mu, I have found only two tableaux depicting her destruction. First I found the Egyptian, and next this North American Indian. Legend: “The Creator considered the destruction of the Motherland of Man. So the Four Great Forces the executors of His commands caused the waters to swallow her up. They caused her to be carried down into a watery abyss and be submerged. Three Vignettes from the Egyptian “‘Book of the Dead” depicting the destruction of Mu by falling into a “tank” of fire–a fiery pit. As she went down, flames arose around and enveloped her. Fig. 1. No pillars showing. Fig. 2. The Eastern pillar showing. Fig. 3. All of the four pillars are found showing. 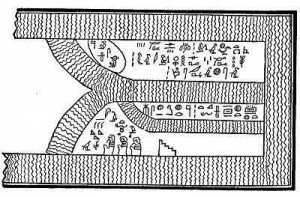 This Egyptian Vignette shows one phase only of the destruction of Mu, how she sank into the fiery depths, The Nootka Indian shows the other phase, her burial by water. Arizona also supplies data on Mu’s destruction by the symbolic pictures, pecked on her stones by the men of past ages. The American records are hoary with age. Nagas only. It cannot be over 12,000 years old, because the writing is a description of the destruction of Mu. It was bought from an Indian in Mexico City who said he found it in a ruin. We must take the statement for what it is worth. The Field of Aarru, Chapter 110, “Book of the Dead.” This large vignette, one of the largest in the Book of the Dead, was not comprehended by Ezra or any of his associates. Neither has it been comprehended by any Egyptologist of the present time. To substantiate my contention I have shown the two ends of this symbolic picture. The Vignette depicts the life of man in the Motherland. The lower part is a conventional map of Mu. 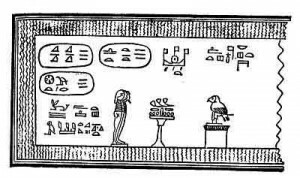 On the left hand top corner of the upper part, there are three cartouches bearing the names of three waters, shown in the lower part. The lower part also shows three lands, each surrounded by water. The names of these waters as read by Egyptologists are: Power of waters. Innumerable waters. Great place of waters. Verse 8 And the Lord God planted a garden eastward in Eden and there he put the man whom he had formed. for food: the tree of life also in the midst of the garden, and the tree of knowledge of good and evil. Verse 10 And a river went out of Eden to water the garden; and from thence it was parted, and became into four heads. Verse 11 The name of the first is Pison, that is it which compassed the whole land of Havilah, where there is gold. Verse 12 And the gold of that land is good, there is bedellium and the onyx stone. Verse 13 And the name of the second river is Gihon the same it is that compasseth the whole land of Ethiopia. Verse 14 And the name of the third river is Hiddekel: that is it which goeth towards the east of Assyria, and the fourth river is Euphrates. The Four Genii, as I have previously stated, were, to my mind another vestment of the Sacred Four; which, in turn were given the name of the Four Great Pillars, the executors of the Creator’s commands. Kan-Bacab–the Yellow Bacab, placed in the South. Chac-Bacab–the Red Bacab, placed in the East. Zac-Bacab–the White Bacab, placed in the North. Ec-Bacab–the Black Bacab, placed in the West. 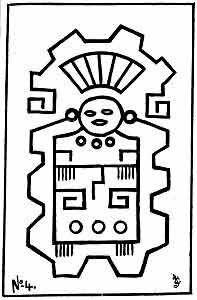 It is thus seen that the Mayas, chose to define their genii by colors. Rouvera–the God of Wealth, placed in the North. Yama–the judge of the Dead, placed in the South. Indra–the King of Heaven, placed in the East. Varona–the God of the Waters, placed in the West. The Genii were also called gods by the Hindus. Tai-Tsong–the Yo of the East. Saing-Fou–the Yo of the West. How-Kowang–the Yo of the South. Chin-Si–the Yo of the North. [paragraph continues] The Chinese symbolized these mountains as a mountain in the shape of a triangle with an eye at the apex of the mountain looking down from it. Amset–the genius at the Cardinal Point in the East. Hapu–the genius at the Cardinal Point in the West. Tesautmutf–the genius at the Cardinal Point in the North. Quabsenuf–the genius at the Cardinal Point in the South. Chap. 125, Book of the Dead, has a large picture of the great Hall of Truth of Osiris. Near the seat of Osiris in this picture are shown the Four Genii. They are symbolized as men in mummy form. One has the head of a human being, another the head of a monkey, a third the head of a hawk, and the fourth the head of a jackal (Anubis). 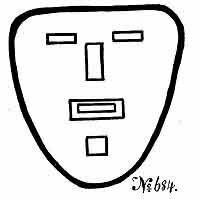 Sed-Alap or Kirub–Represented as a bull with a human face. Lamas or Nigal–Represented as a lion with a man’s head. Nattig–Represented with the head of an eagle. The Hittites, Assyrians and Persians all had the Genii engrafted in their cosmogony. The Israelites. Although I cannot find any direct reference in the Jewish research which I have made, that is no criterion and does not say that they entirely rejected the idea. given as a vision of Ezekiel. At the time this was written Ezekiel was a captive among the Chaldeans. Let us compare this vision with the Chaldean creed which had been in existence thousands of years before Ezekiel came on earth. Ezekiel’s dream. Four beasts with the heads of a man, another an ox, another a lion, and the fourth, an eagle. Chaldean Belief. Four Genii, beasts with heads; one with a human face, one with a face of a bull one with the face of a lion and the fourth with the face of an eagle. These Chaldean genii stood at the bottom of steps leading to temples and palaces, one could not walk through a city without seeing many of them. Thus to me it seems unquestionable that Ezekiel must have seen many of them during his captivity. A set of four is now in the British Museum and came from the king’s palace, Nineveh. Ezekiel’s vision looks like an embellishment of the Chaldean Creed. Is the Biblical translation correct? symbol of Mu, the Motherland. It was also the symbol for mother, earth, land, country, empire, anything pertaining to the soil. The hieratic letter N, the alphabetical symbol for the Serpent of Creation. The hieratic letter T, pronounced Tāó, the alphabetical symbol for resurrection, also emersion. Used in the Sacred Writings symbolizing Mu’s emersion. The hieratic letter U, pronounced as oo in moon. The alphabetical symbol for an abyss, a deep hole, a valley. In the body of a word another of the “u” glyphs is generally used as a V.
This glyph is often found in ancient writings. It is one of the figures that was used to symbolize the Four Great Primary Forces–the Sacred Four. It is composed of four circles, each with one of its sides incomplete. Another glyph symbolizing the Sacred Four. 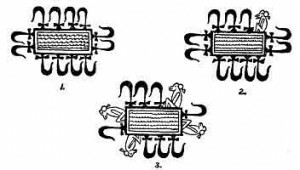 This was a very favorite symbol among the Uighurs and is revered by the Chinese today. I have also found it as a dress ornamentation among the South Sea Islanders especially the Polynesians. the ten tribes of people who went down with the Motherland at her destruction are spoken of. 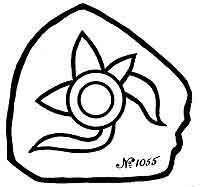 Apparently this is a Maya symbol. I have found it in no other writings. 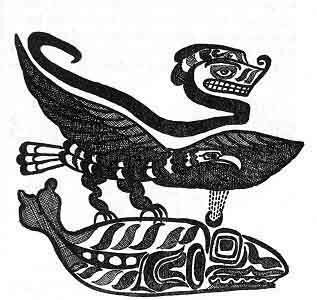 It is found in the Maya description of the destruction of the Motherland. It reads: “Peaks only rise out of the abyss.” It therefore refers to the islands that were formed between the gas chambers. An equilateral triangle with the monotheistic symbol of the Deity within symbolizes: the triangle–Heaven, The circle within–the Deity, reading the Deity, the Infinite, dwells in Heaven, Heaven is His abode. An equilateral triangle with an eye within symbolizes the Deity looking out from heaven. In Egypt it was changed to the all seeing Eye of Osiris looking down from heaven. These two symbols are found in all ancient writings. Rather, they appear in many writings and among all people. used by the Egyptians as an equivalent for an eye. Are Breast Screenings The Biggest Catastrophe In Women’s Health Today? The NSA’s message from the Extraterrestrials, on their website!